Here's an easy way to get your child interested in geography. Give him some time with this coloring page focused on West Virginia to trace and color his way to learning! This coloring page will help your first grader learn to identify the state of Virginia, its name and flag. Trace and color the outline of Maine and its flag in this geography worksheet. This geography worksheet lets your child trace the outline of Kansas, color, and learn! Trace the outline of New Mexico in the easy U.S. geography worksheet. Trace the outline of South Dakota in this worksheet that teaches geography. In this coloring sheet your first grader will trace the outline of Delaware, the official First State in the Union. This worksheet makes for an easy introduction to maps and states as kids trace the outline of Missouri. In this geography worksheet, kids will trace the outline of Kentucky and get to color in all the details of the state flag. Trace Louisiana's boot-like outline and color the flag featuring the state bird in this geography worksheet. 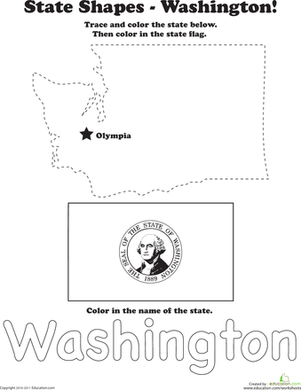 In this worksheet, kids trace the outline of Washington and color the state, and also learn to recognize the state name and flag.